This model of medieval men's cotta with taper sleeves and cuts fore and aft, is typical for XII-XIII centuries. Cotta is decorated with thread of contrast colour on the neckline and sleeves. It goes perfectly with short chausses and chemise. We recommend you to order this cotta with lining, as it will make the wearing more comfortable and long-term. This model of shirt is made in typical European style of IX-XII centuries. It was a basic element in the traditional multilayered medieval costume. The neck and sleeves of this undershirt are decorated with the contrasting thread. The whole decoration is handmade. The chemise is being made of 100% natural fabrics: linen, cotton, wool, velvet or silk. Different colours are available for order. 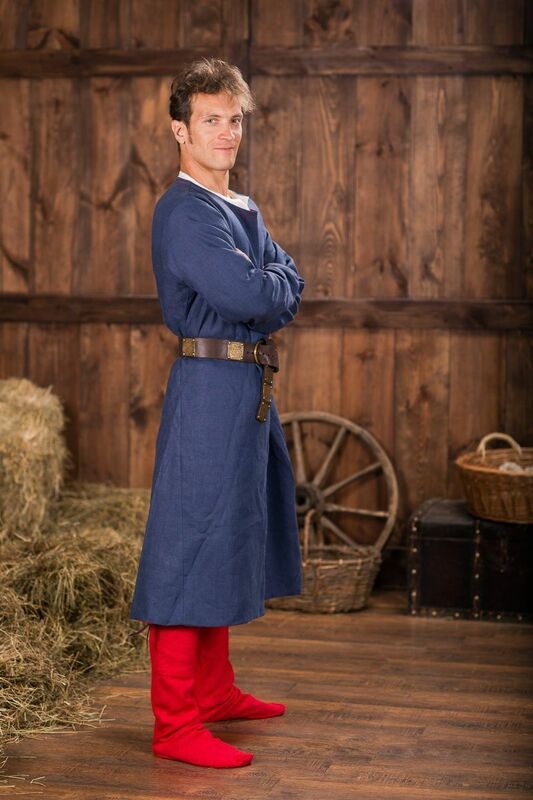 A good supplement for this shirt will be a tunic and a gambeson, chosen according to your wishes. ..
Any re-enacting starts from the well thought-out garment. 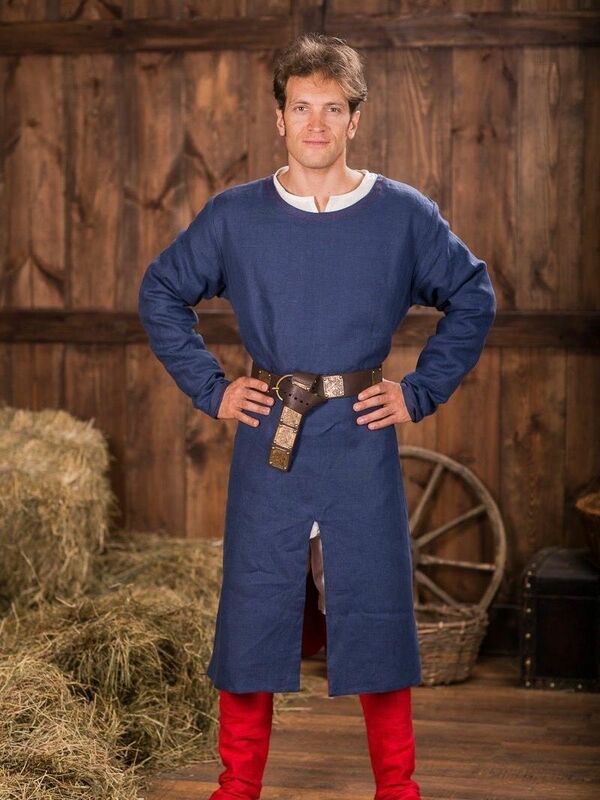 Tunic was the main part of medieval clothing. This one has: - 3/4 sleeves that typical for XII-XIII centuries; - decorated with fabric straps on the neckline and sleeves; - cut on the bottom hem from the front provides a good mobility. The lining of contrast colour will make your tunic not only unique model, but very comfortable as well. 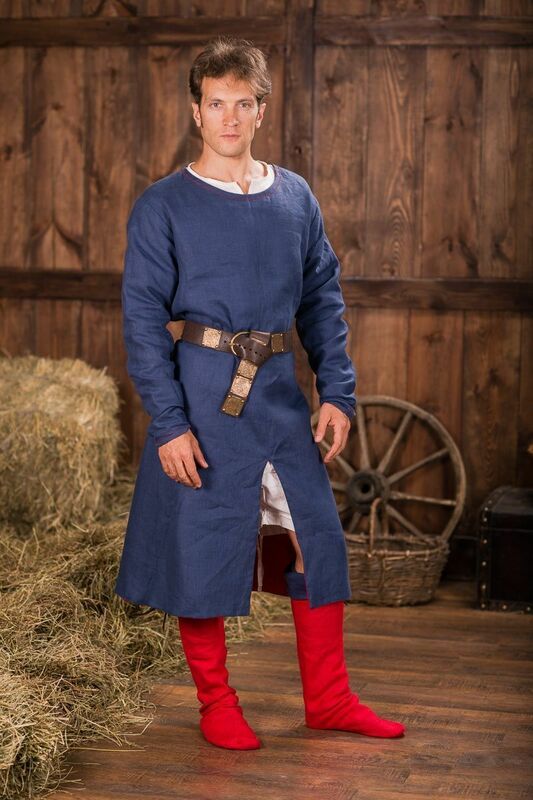 Tunic goes well together with chausses and gambeson with festoons. We use only natural fabrics for manufacture. Please choose main colour in options, and send the wished colour of lining to us [email protected] ..
Cotardie was a very popular medieval men's cloth in the XIV-XV centuries. This tight fitted type of jacket often has a lot of buttons from the front and on the sleeves for fastening. This model of cotardie has 10 buttons from the front and tight sleeves on the wrists. Lining of contrast colour will make you cotardie not only more comfortable, but also very beautiful and unique. Long chausses will be a great additon to the cotardie. Base price includes the lining made of cotton. You may also choose linen as lingn fabric in options. Please send the wished colour of lining to us [email protected] ..
Leather vest with diamond pattern Modest and costly, full of royalty and monkish humble, this leather armor costume represents leather vest with diamond pattern – true choice of the kings. This armor is for everybody who wants to have royal look without spending the treasury. Steel armor provides with perfect protection, but it is quite heave and will restrict your movements. Expensive brocade or velvet doublet is sightly one, but it will not protect you at all. So, in this sticky situation, when you need not too strong, but comfortable body protection, which look so good-looking that it is not a shame to wear it for royal court, so there is only one choice – functional leather armour – light, firm and steady going. The best armorers of Steel Mastery have made precisely this leather costume. Inspired as by ancient gravures of the medieval knights, so by modern pictures of fantasy warriors, after long meetings, debates and fights, our masters reached conclusion and created perfectly sustainable medieval le..